The BlackBerry PlayBook has dropped in price to a mere $199 for the most basic version making it hard to resist if you’re looking for an affordable option, but in order for the 7-inch tablet to truly become a work station, you’d need to add a keyboard. 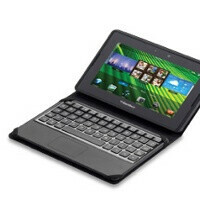 After hearing whispers in the wild for a while, RIM is now unveiling its PlayBook keyboard case. The case is available for pre-order at etailer The Source, but there's one little problem – it costs a whopping $99.99 and after April 12th, 2012, that price is going to grow to $119.99. If you pre-order it today, it will ship by March 23rd, 2012. That is half the price of the tablet itself, so we imagine many users will think hard before buying this. Nonetheless, it seems to be a good product - keyboard, integrated touchpad and case, that's how it's advertized and the battery is said to last up to 30 days on a single charge. The case alone weighs 176 grams. “Unfold the case quickly and easily to create a workstation anywhere. The wireless connection is easy to set up and encrypted to protect every keystroke and swipe,” The Source explains. Hit the link below to pre-order or just take a better look at it and let us know how you like it in the comments below. It apears to be a 60% sized keyboard, what's the point?